As the lack of posts reveals, I've been really busy which doesn't leave much time for blogging. I've also been trying to be a bit away from the computer, except for work or really important issues. I have a lot of stuff that has been postponed for too long and now my life is beginning to depend on it. Before BlytheCon UK I was really busy sewing like a madwoman to have stock for the stall, then after BCUK I stayed a few days in the UK and visited Yorkshire, which I loved. As I came back home I was immediately snatched by work and since that job finished I've been trying to put my real life in order. 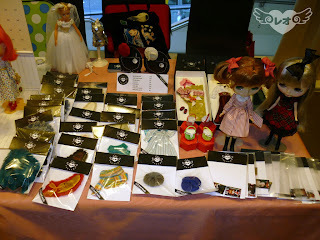 BlytheCon UK 2012 was a blast and it keeps getting better! The Double Tree hotel, where the con was held, is an amazing hotel and the staff were incredible helping with the organization. Having a stall provides a completely different experience and you get to know people in a different way. It was also lovely to meet all my British (and not just British) online friends again and make new ones. There were two other Portuguese attending, Xanamaneca, whi shared a stall with me, and Blythiful, the editor of the magazine with the same name. This year there were a lot of new Blythe-people which made it an all new BCUK, filled with new faces. Thank you everyone who passed by my stall and said hi! 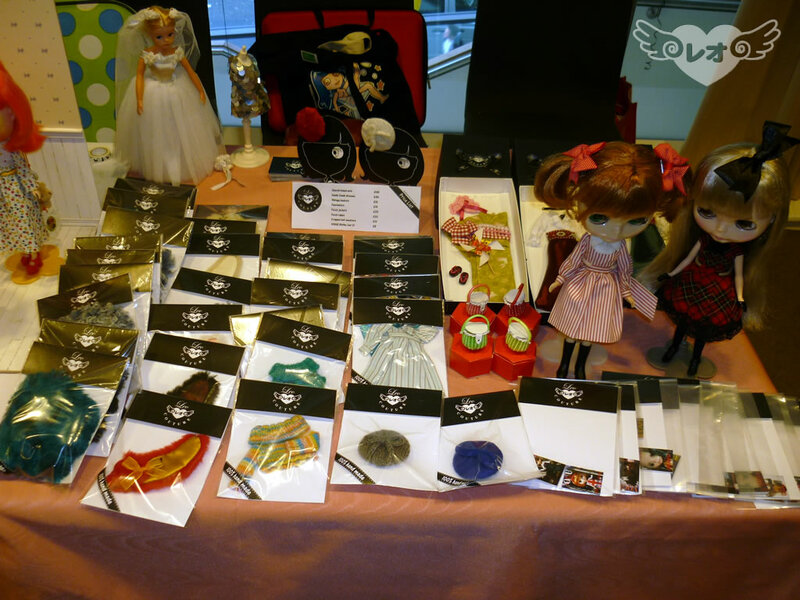 Didn't buy much, some buckles at Retro Dolls, a necklace at The Cat's Meow and some hair clips at Arrietty's Armoire. Since then I finally opened my Etsy, where the Fuzzy Collection and the BCUK's Paper Doll are already listed. Expect more in December, the remaining BCUK goods and more! As other great news, BlytheCon UK 2013's logo and illustration are also drawn by me, so meet the Lassie Blythe! Piparrot and Fifilatrixabel, both organizers, are wonderful and fun girls and I'm really excited about Glasgow! Some of my BCUK 2012 photos can be seen at my Flickr gallery and all of them at my Fanpage. I hope to meet everybody again in Glasgow, expect tartan, lots of tartan! Como a falta de posts o revela, tenho andado muito ocupada, o que não me deixa muito tempo para blogar. Também tenho andado a tentar estar longe do computador, excepto para trabalho ou assuntos mesmo importantes. Tenho imensa coisa que tem sido adiada há demasiado tempo e a minha vida começa aestar dependente disso. Antes da BlytheCon UK estive muito ocupada a costurar como uma louca, a fazer stock para a banca, depois da BCUK fiquei uns dias no Reino Unido e fui ao Yorkshire, que adorei. Assim que voltei fui raptada pelo trabalho e desde que esse trabalho terminou tenho andado a tentar organizar a minha vida. A BlytheCon UK 2012 foi bestial e melhora a cada ano! O hotel Double Tree, onde foi a con, é fantástico e os funcionários foram incríveis a ajudar na organização. Ter uma banca faz com que a experiência seja completamente diferente e conhece-se as pessoas de modo diferente. Foi maravilhoso voltar a encontrar os meus amigos britânicos (e não só) da internet e fazer novos amigos. Havia mais duas portuguesas, a Xanamaneca, que partilhou a banca comigo e a Blythiful, editora da revista com o mesmo nome. Este ano havia muita gente-Blythe nova, que renovou a BCUK, cheia de caras novas. Obrigada a todos os que passaram pela minha banca! Não comprei muita coisa, umas fivelas na Retro Dolls, um colar na The Cat's Meow e uns ganchos na Arrietty's Armoire. Desde então finalmente abri a minha loja na Etsy, onde já estão a Fuzzy Collection e a Boneca de Papel da BCUK. Haverá mais em Dezembro, a restante mercadoria da BCUK e mais! Outra boa notícia é que a ilustração e logótipo da BlytheCon UK 2013 também são desenhados por mim, conheçam a Lassie Blythe! A Piparrot e a Fifilatrixabel, as organizadoras, são moças fantásticas e divertidas, estou muito entusiasmada com Glasgow! Podem ver algumas das minhas fotos da BCUK 2012 na minha galeria do Flickr e todas na minha Fanpage. Espero reencontrar todos novamente em Glasgow, esperem tartan, muito tartan!